If you want to get what can be termed an almost ideal espresso, cappuccino, or latte at home, you can use a lever-based espresso machine, which is also known as a manual or semi-automatic espresso machine. 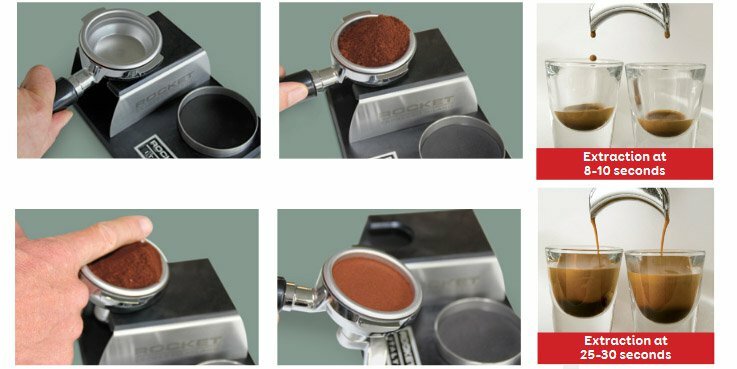 Although it is quite expensive, it provides more effective extraction and requires only two thirds the amount of beans most other machines require. There are standalone and built-in semi-automatic coffee makers. Once water reaches 92-95°C, 15-bar pressure forces it through the portafilter filled with coffee grounds. Thanks to this not so dramatic temperature, hot drink retains aroma and flavor. There are steam-driven and pump-driven semi-automatic appliances. Steam appliances are driven by steam released by boiling water. Steam passes through a valve and is forced through a layer of pressed fine-ground coffee. Steam pressure does not exceed 4 bars. These appliances are also known as ‘boiler coffee machines’. In pump-driven appliances water is heated by an electromagnetic pump. Pressure rises up to 15 bars. They brew much faster, and, according to numerous positive feedback, drinks taste better than those from semi-automatic steam coffee makers. First, fill the boiler with water. Pour coffee grounds into a holder (portafilter), hand-tamp it into a tablet-like piece with a tamper and place it into the brewing unit. Now, all you need to do is launch the machine and wait about thirty seconds until it pours you a cup of hot drink. More expensive models feature semi-automatic or automatic control systems plus other options, such as rapid steam, heat-up-the-cup, filter size, etc. The quality off coffee depends also on your choice of grains and the quality of grinding. This appliance will brew good classic espresso only if you strictly follow all rules and use high quality grains. Many people think that espressos from an Italian Moka pot and a semi-automatic espresso machine have similar quality. 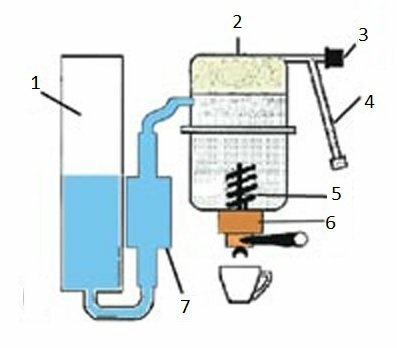 Apart from espresso, most machines can produce milk froth for cappuccino or latte with the help of a manual (panarello) or automatic milk frother, which use steam to froth milk. Quick brewing: it takes 0.5-1 minutes to make one cup of drink. Optimal temperature helps you achieve maximum flavor. Lots of extra functions – automatic shutoff, temperature adjustment, etc. They can brew classic espresso with crema or cappuccino. A large water tank results in large size. Assembly and maintenance are more complex (they feature a self-cleaning system and therefore are more expensive). Well, what characteristics are the most important? Espresso coffee machines feature a metal or plastic portafilter. Metal ones are boast higher reliability and provide more effective extraction. Plastic portafilters make weaker espresso. Appliances featuring two portafilters can produce more portions at a time. For this reason, they are favored at office kitchens and large homes. High pressure makes great espresso. The material the water tank is made of. It is better to use a fiberglass or borosilicate glass water tank instead of a plastic one to prevent water from smelling like plastic. Metal body coffee makers are believed to be stronger and more reliable than plastic ones, although plastic does the job very well too. An espresso machine should have an automatic anti-overheating function, which will prolong the device’s life and prevent you from getting burnt. It is advisable to choose a device with an option that maintains the serving temperature. The appliance must have a drip tray. Also, a semi-automatic appliances can make a pods (k-cups) – a tablet-like serving of ground or tampered coffee packed in a paper filter. One pod (k-cups) stands for one cup of hot drink. There are additional settings and options, which can ease the process of brewing and add flavor to hot drink. Water level indication can tell you when it is time to fill the tank. Automatic shutoff frees you of having to keep an eye on your coffee maker. A removable drip tray is easier to clean than a non-removable one. You can press a stop button if something goes wrong while brewing. Temperature control will help you achieve optimal temperature and desired quality of drink. The size of the water tank is not crucial. An espresso machine with only one portafilter will not make more than two cups of coffee at a time, no matter how big the tank is. After that the portafilter will need to be cleaned and rinsed , so you can pour in fresh water. Even the most reliable and highest quality models do have some issues. Although this post is too small to highlight everything, it describes problems that are common to many models. Water overflows the portafilter. Most likely, this is because of high pressure. Disable the steam function. Crema gets too thin. Switch to another milk type. Use cold milk, and do not dip the milk frother too deep. Irregular work: it breaks down and stops unexpectedly. If you have taken it to a service and no problem has been found, check voltage. Some models are extremely sensitive to even minor voltage deviations. Poor sealing and connections. This is more common for cheap appliances. The only thing you can do about it is replace the sealing. Tangy smell of plastic. Run the machine several times using just water. Use only fresh and purified water for brewing.